I find that tomatoes can improve a variety of different dips. When added to guacamole, the juices create a fresh undertone that cuts the richness of the avocado. Though most of the liquids have been evaporated in the roasting process, the tomatoes in this case have a similar effect, thinning out the dense chickpea mixture, bringing another element of acidity to the lemon juice, and adding a subtle red tint, complemented by garnishing with a sprinkle of paprika. Read the original post here. On a rimmed cookie or baking sheet, arrange the tomatoes in a single layer. Sprinkle with 1 clove of the minced garlic, 1 tbsp of olive oil, and plenty of salt. Pop in the oven and roast for 15-20 minutes, until the tomatoes are beginning to caramelize but are not blackened. Remove and set aside to cool. In a small food processor, combine the chickpeas, remaining garlic, lemon juice, tahini, cumin, paprika, and salt. Puree the mixture, adding the water as needed to thin it. Remove any bits of blackened skin from the tomatoes. Add tomatoes to the food processor along with parsley (if using it) and puree until combined. Mix in a dash of cayenne if you want to give a little kick to the hummus. Taste for seasoning. 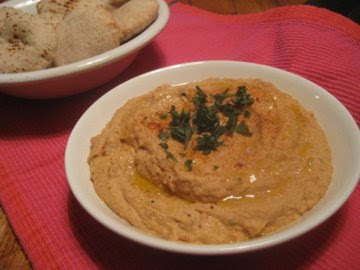 Garnish hummus with a couple dashes of paprika, a drizzle or two of olive oil, and a few leaves of parsley. Serve with toasted pita, torn baguette, or carrots. This sounds delicious and super easy!! First thing I’m making when I get a food processor….